Zimbabwe's government on Monday denied reports that it had signed an agreement allowing Iran to mine uranium, saying there was no certainty that the southern African state had commercial uranium reserves. President Robert Mugabe told Iranian President Mahmoud Ahmadinejad in Harare last week that Zimbabwe backed Iran's controversial nuclear program and accused the West of seeking to punish the two countries for asserting their independence. But Industry and Commerce Minister Welshman Ncube on Monday dismissed a report in Britain's Daily Telegraph claiming Harare had struck a deal allowing Tehran to mine untapped uranium reserves to secure raw material for its nuclear program. The report said Zimbabwe would get oil for access to potential uranium deposits. "It's not true. No such agreement was signed," said Ncube, a minister from a splinter faction of the Movement for Democratic Change in Zimbabwe's unity government. "There is no certainty that Zimbabwe has uranium deposits. You first have to prove that there are uranium deposits and that has not been done," he told Reuters. 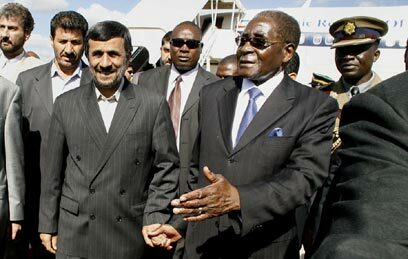 Ahmadinejad was in Zimbabwe last week for a two-day visit and there was no official indication of any link between his trip and Iran's nuclear program. Mugabe has previously said the country holds uranium deposits which have yet to be exploited. Iran faces a possible new round of United Nations sanctions over its refusal to halt uranium enrichment. The West accuses Tehran of trying to build nuclear weapons. Iran says it aims only to generate electricity. Ncube said Zimbabwe and Iran had only signed general cooperation agreements in the fields of energy, science and technology and agriculture but officials from the two countries still had to meet to finalize details of any investment. Asked whether Zimbabwe would in future consider jointly mining uranium with Iran, Ncube said: "There is no evidence that Zimbabwe has commercial deposits of uranium, so that question does not arise at all." See all talkbacks "Zimbabwe says no uranium deal with Iran"